First published in 1995 and now reprinted in paperback form in 1997 . Printed in a portrait format and on A4 paper of good quality but matt finish. 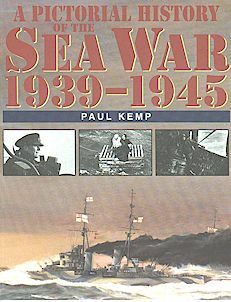 The book covers the sea war in a black and white photomontage selected from official war photographs with a small accompanying narrative. It packs a hell of a lot of information in its' 192 pages with good quality black and white photographs - well over 400 plus. It is split into 11 chapters, which are titled as follows. Fleet Actions, Carrier War, The defence of Seaborne Trade, Submarine War, Anti Submarine War, Logistics, Amphibious Operations, The Commanders, Midget Submarines, Life at Sea, Victory and Defeat. This is one of those books that you can pick up and put down and still find something new each time you read it. I know from personal experience that one section, Logistics, re-awoke a load of old memoirs for me. I could hear the sound of the riveter's gun and smell the hot steel as it was being cut, fresh paint and the damp smell of cold steel on a foggy morning. I served my apprentice ship in the shipyards and recognised several of the buildings and docks in the backgrounds. If there were one book that I would love to have a scratch and sniff attachment to it this would be the one! It will certainly bring many happy and not so happy memoirs to any old salt that reads this book. To any serious model maker who builds ships or researcher on the Sea War then I highly recommend this book to you.